The company was formed in 1889 by Henry David Lee as the Lee Mercantile Company at Salina, Kansas producing dungarees and jackets. The growth of Lee was prompted by the introduction of the Union-All work jumpsuit in 1913 and their first overall in 1920. Later in the 1920s Lee introduced a zipper fly and continued to expand. Around this time, the first children's overall line was sold. In 1928 H.D. Lee, founder and president of The H.D. Lee Mercantile Company, died of complications following a heart attack. During the 1930s and 1940s the company became the leading manufacturer of work clothes in the US. In 1944, the Lazy "S" became the official Lee back pocket. A flood wiped out Lee's Kansas City distribution center. It ruined the entire stock of merchandise, except the Buddy Lee dolls, which floated. 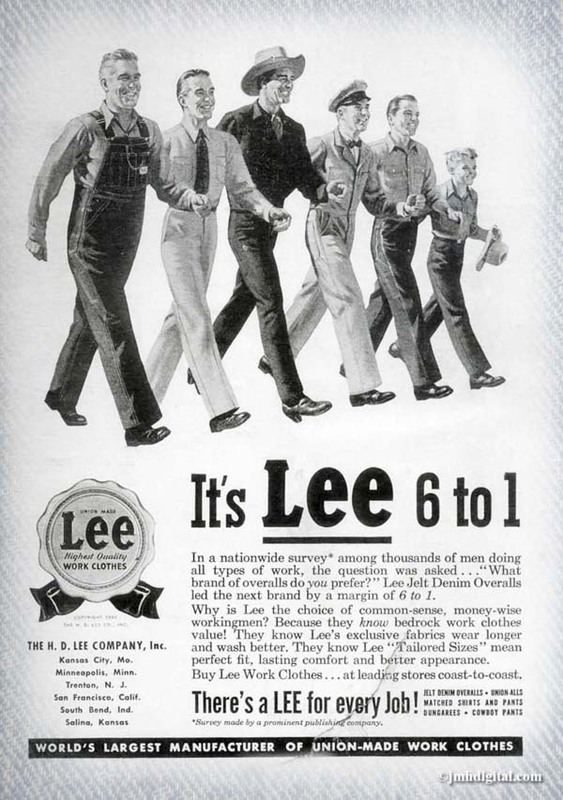 In 1954, Lee expanded into casual wear. During the 1960s the company expanded to 81 countries and in 1969 was acquired by VF Corporation, becoming a brand. Lee aired its first television advertisement, which promoted Lee western wear. In the 1970s Lee shifted its focus from the workwear business and began catering to fashion cycles. Lee created an all-new fit for women under the Ms. Lee label. A youth wear line for boys and girls was introduced. In 1996 started Lee National Denim Day as part of National Breast Cancer Awareness Month. Working with the Entertainment Industry Foundation, Lee National Denim Day has raised over $75 million to help fund breast cancer research programs. Thats the brand I am wearing in the Zombie Apocalypse!! Cool - did not know all that. Thanks for sharing.